Loesch’s CPAC speech was welcomed by the audience who stood and cheered her characteristically defiant address. A little more than a week after a mass shooting at Marjory Stoneman Douglas High School in Broward County, the CPAC audience was ready to defend gun rights, and happy to see them entangled with the rhetoric of freedom and conservatism. Loesch’s speech tried to absolve both the NRA and gun owners from any responsibility for the mass shootings that have become a grim fixture at American schools. 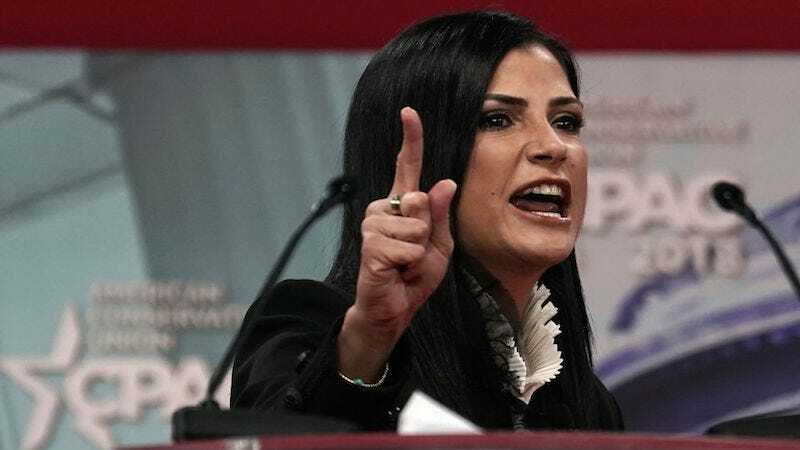 The CPAC audience was ready for a rally and Loesch delivered the combative one-liners that have secured her place as a conservative celebrity. But if Loesch’s CPAC speech was standard for the NRA spokeswoman, then it was a vast departure from her January 21 appearance at CNN’s town hall on gun violence, the night before. On Wednesday, Loesch toned down her usually combative rhetoric, offering a kind of empty empathy to mothers who had lost children and Douglas students who wanted answers. Loesch had few answers but she came equipped with talking points that she reiterated more fervently on the CPAC stage. On CNN, she redirected any blame away from the NRA or its increasingly controversial policies. Instead, she pointed to “insane individuals,” who were allowed to purchase guns because of systemic failures, to states who failed to report offenders to the National Instant Criminal Background Check System (NICS) and to law enforcement agencies that have repeatedly failed to stop mass shooters, despite warning signs. “None of us support people who are crazy, who are dangerous to themselves, who are a danger to others, getting their hands on a firearm,” Loesch said. At CPAC, Loesch made clear that gun owners weren’t to blame for the mass shootings. Instead, the narrative had transformed them from good citizens into veritable criminals; transformed freedom into martyrdom. Gun owners, Loesch said, will “not be gaslighted” by the media. The line earned her a standing ovation. But if gun owners and NRA members had been unfairly targeted by the media and the left, then Loesch herself was practically saint of the cause. “I had to have a security detail to get out,” Loesch said of the CNN town hall, located just a few miles away from Douglas High School. “I wouldn’t be able to exit that if I didn’t have a private security detail. There were people rushing the stage and screaming ‘Burn her!’ And I came there to talk solutions and I still am going to continue that conversation on solutions as the NRA has been doing since before I was alive.” Reporters and attendees both disputed Loesch’s account, saying that students and supporters had chanted “Shame on you!” as she left the building, but no one had threatened her safety. But Loesch’s point had been made persuasively to an audience primed and ready for sympathy agreement: the NRA is the preserve of freedom while opposing policies represented tyranny. “Some people want all of us to disarm. You heard that town hall last night. They cheered the confiscation of firearms. And it was over 5,000 people,” Loesch said. The left wanted to confiscate guns, and the media was cheering mass shootings, but the NRA—arm in arm with conservativism—would build a wall to protect both freedom and decency. If Loesch’s speech seemed callous in the wake of 17 deaths, then it was just the beginning of the NRA’s attempt to reframe the post-Douglas narrative—a standard move in the group’s playbook. After Loesch finished with her speech, which included a plug for her show on NRATV, Wayne LaPierre took the stage. LaPierre’s speech was slow, plodding and paranoid; its themes largely echoed what Loesch had already presented with more passionate delivery. LaPierre warned of dangerous madmen and government failures that had contributed to the rise of mass shootings. He warned of “European-style socialism,” a phrase that he seemed to think deeply effective. Like Loesch, LaPierre took aim at the media which, he claimed, is “eager to smear the NRA.” But if Loesch was a martyred saint, then LaPierre was an oracle. During his speech, he played video of an interview he gave nearly 30 years ago where he made points similar to those he made on stage Thursday. Loesch and LaPierre seemed to agree that the media was the enemy, the government could not be trusted, and gun owners were being tyrannized, but they parted ways on Loesch’s talking points on the NICS. While Loesch chastised states for failing to add Dylan Roof and Devin Patrick Kelley to the NICS (something that would have made them illegible to purchase weapons), LaPierre hedged his proverbial bets. It was unclear what the NRA’s presence at CPAC would be prior to Thursday. Loesch and LaPierre were initially confirmed as speakers but in the earliest agenda sent to reporters, the pair were glaringly absent. Perhaps part of the NRA’s standard response to a mass shooting: a week of silence followed by tightly scripted one-line talking points. Following the Douglas shooting, the group remained silent for six days on Twitter. The Washington Examiner reported that CPAC organizers purposely withheld LaPierre’s name from the schedule, as well as any mention of the NRA (Conference organizers did not respond to Jezebel’s request for comment). But by Wednesday, it was clear that CPAC organizers were ready for the NRA to command the main stage. “It would be a mistake for CPAC to back away from having appropriate conversations about the Second Amendment,” Chairman Matt Schlapp told Fox News. By Wednesday night the NRA was constructing its stand—flashy and large at the very front of CPAC’s vendors’ hub and, by Thursday morning, Loesch’s ads for the organization played on a loop. “We’re not going anywhere,” Loesch said. Later she added, “we call B.S.,” a line she appropriated from Douglas student and survivor, Emma Gonzalez. Both Loesch and LaPierre’s speeches lingered as, right after, Vice President Mike Pence took the stage.